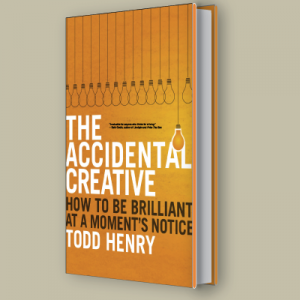 I recently finished reading Todd Henry’s “The Accidental Creative” (check out an earlier post about the book), which has amazing insights and suggestions for developing sustainable creativity. If you’re paid for your creativity (that’s most of us), this book is for you. Here are three lessons that I’ve been putting to action already. 1. Take (and review!) notes. If you’re like me, some of your best ideas come out of nowhere when you least expect it. For me, it’s often while I’m going for a jog that my mind entangles some of the problems I’ve been working on, or I get a flash of insight. When we get these great ideas we often think they’re so amazing that we’ll never ever forget them… but we do. To help collect our ideas, some that could lead to big payoff later in the day or somewhere down the road, Henry suggests bringing a small notebook everywhere you go, getting in the habit of writing down your ideas when they occur. While I’d already been a fairly diligent note-taker (I often prefer to use Evernote for its easy tagging and searching capabilities), Todd Henry’s second tip is the one I am really excited to implement: making time to review your notes. While the act of writing down ideas can help solidify them in our memory, too often I find my notes just disappear. Making time for reviewing your ideas and inspiration will help connect the dots over a week or month’s time, and will help you find new application for past ideas. 2. Make time for study. While I was reading this very book, I realized how much I missed having my nose buried in a book. A busy summer and fall had squeezed out some of my reading time, and I immediately felt the effects of the increased study time. I felt sharper throughout my day, as the mental stimulation found application in many of the projects I was involved in. In the book, Henry suggests making time several times each week to study both topcis related to the things you’re currently working on, as well as seemingly unrelated topics that simply interest you. I’m hoping to make reading and listening to podcasts a regular part of my diet in the coming months. 3. Take “whole-life energy” into account. When you’re making a plan for your upcoming week or month, rather than looking only at managing your time, Henry suggests managing your energy levels. Just because there are enough hours in the day to schedule various tasks and activities, you may not have the energy to give yourself fully to them. I’m often guilty of failing to consider the energy requirements of my various commitments, and need to remind myself to focus my efforts if I want to be effective. He also suggests not splitting your work and personal life when looking at your upcoming commitments, because the demands in one realm will undoubtedly affect the other. When you’re have a particularly busy or stressful week or season at work, make sure you don’t over-commit yourself in your personal life. Being creative isn’t an “in the moment” process. You have to look far upstream to develop the habits that foster creativity when you need it. I’m looking forward to implementing more of the practices found in “The Accidental Creative”, and I hope you can develop the disciplines to be effective on the long arc of your creative life.